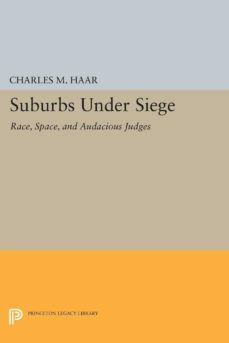 In Suburbs under Siege Charles Haar argues passionately that all people--rich or poor, black or white--have a constitutional right to live in the suburbs and that a socially responsible judiciary should vigorously uphold that right. For various reasons, American courts have generally failed to question local zoning regulations that trap the urban poor in the squalor of inner cities, away from decent housing and jobs in the suburbs. No U.S. Supreme Court case, for instance, has confronted exclusionary zoning rules, as Brown v. Board of Education once attacked school segregation. Instead, judges at all levels have most often reinforced the residential segregation that may well destroy American society. In this provocative book on the landmark Mount Laurel cases, Haar shows how the N.J. state judiciary broke out of this pattern of judicial behavior. These courageous, innovative judges attracted nationwide attention by challenging the forces of affluence that ruled the suburbs (and the legislature) of their state. Furthermore, they based their reasoning on the N.J. state constitution in order to protect their rulings from invalidation by the U.S. Supreme Court.In the early 1970s, when the cases began, the plaintiffs, Ethel Lawrence and her daughter Thomasene, were barely making ends meet in the Philadelphia suburb of Mount Laurel, a town where their African-American ancestors had lived for seven generations. The Lawrences dream was to live in a Mount Laurel garden apartment planned by a grassroots reform group as affordable housing: in their way stood a typical minimum acreage zoning ordinance. The eventual court victory of the Lawrences and their young public interest attorneys inspired other N.J. suits and a process of remediation that continues to this day, as judges, experts (special masters), the state legislature, and other citizens work to carry out the Mount Laurel principles. Haars book is a bold attack on conventional doctrines of the separation of powers limitations on the judicial branch and a plea that judges across the country assume their proper responsibilities for fair housing before it is too late.Originally published in 1996.The Princeton Legacy Library uses the latest print-on-demand technology to again make available previously out-of-print books from the distinguished backlist of Princeton University Press. These paperback editions preserve the original texts of these important books while presenting them in durable paperback editions. The goal of the Princeton Legacy Library is to vastly increase access to the rich scholarly heritage found in the thousands of books published by Princeton University Press since its founding in 1905.